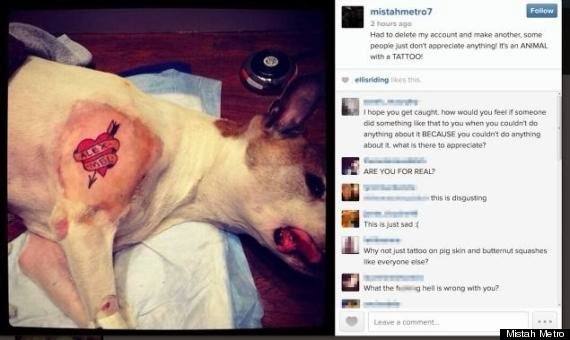 Brooklyn Tattoo Artist Outraged Netizens after Inks Dog - Exam News, Reviewer, Military Career, & Everything [MN] . .
First reported in Gothamist, a Brooklyn Tattoo Artist named Mistah Mistro make a headline after he inked his own dog and posted the photo on Instagram while the pet was unconscious following a medical procedure. Can be seen in the photo tatting an arrowed heart on the brown and white pit bull's shaved right shoulder. "One of the many reasons my dog is cooler than yours!" Metro captioned the Instagram post. "She had her spleen removed today and the vet let me tattoo her while she was under." he added. Although tattooing an animal is not illegal in New York. Last year, Assemblywoman Linda Rosenthal introduced a bill that would prohibit "animal piercing and tattooing except for identification or medical benefit. The ASPCA condones the use of tattooing for only identification purposes following spay or neuter surgery. This practice helps animal welfare professionals clearly identify animals that have been altered, thereby preventing unnecessary future surgeries. This painless procedure is performed by a licensed veterinarian or veterinary technician while the animal is under anesthesia. The marks are very small and have a specific purpose, which is to avoid inflicting undue pain and stress later if that animal is unknowingly brought in for a spay surgery a second time. Tattooing an animal for the vain sake of joy and entertainment of the owner - without any regard for the well-being of the animal - is not at all comparable to the incident in question and is not something the ASPCA supports.